Afternoon! I thought I would upload another interiors post this week as we are having part of the bedroom done next week. To look at the floor plan I think the room is quite uninspired, it is an average size, double aspect within off centre fireplace. What makes this room wonderful is the height and the beams. It must be 25ft high and it makes the room seem so big and airy. Having a window on either side is also a new concept after living in a back to back terrace for the last 5 years. One of the windows is south facing and gets beautiful evening light, the other facing north doesn't bring much apart from gorgeous landscape views of the park and a massive house that took me, and team instagram a while to figure out just where it was. Like I said in last weeks interiors post, there was no room in here for a wardrobe as the alcoves either side of the fireplace are so shallow which is why its going in the office but that did leave a little bit of space for what Michael calls my 'babestation' and somewhere for the dog to sleep on the other side. Colour wise I have opted for blacks/dark blues and just the mustard bed for colour, with some gold thrown in here and there. 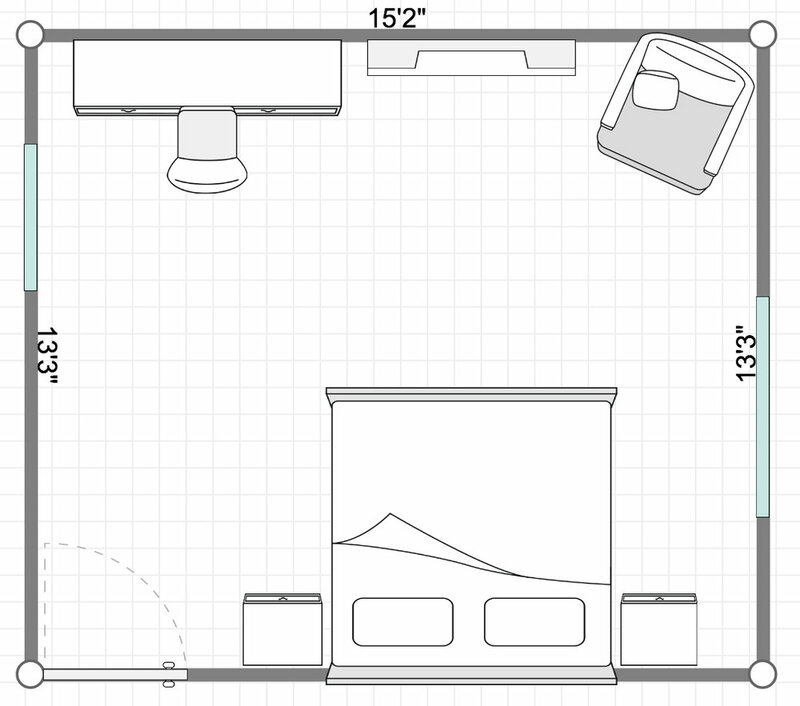 Here is how the room is currently laid out, the only things happening in here will be the addition of wood wall panelling behind the bed everything else will remain the same for now, eventually we will strip the floorboards but apart from that this room is all cosmetic. I am not quite sure this is to scale but it gives you an idea. We purchased the bed as soon as we had swapped contracts, we waited on and off for it to be in stock and when it finally was we snapped it up. I first saw it when Rebecca went to Soho House Barcelona for the blog and she sent me a picture of the room she was staying in. It was love at first sight ( I mean she always takes good photos but ya know), I know it's not to everyones taste and to be honest, it will probably date quite quickly but for now I think it may be my favourite item of furniture. And here it is in situ. We opted for a super-king without even measuring the room (we didn't have access to the house) and thankfully it fits wonderfully, it dominates the room but I think a bed should in a bedroom, after all, that's why you are there. Mattress wise we opted for Casper. We bought one for the guest room as we needed something ASAP and we could order it whilst at the old house then take it over with us, unroll and ready to sleep on that night. We were so impressed with it we didn't go ahead with our initial choice and bought a super-king size mattress (which is not the EU king btw you want 180x200) from them too. It is so comfy (this isn't an ad, everything in this post was most unfortunately paid for with our own money). The price point is great and genuinely had some of my best nights sleep in that bed. You spend so much time in bed that I think it is worth the investment in pieces such as a good mattress and pillows, they may not be pretty but over time you will sleep better. Linen and pillow wise we bought a mixture of The White Company and John Lewis. I didn't even know you could get super king sized pillows but they make such a difference. I have a White Company goose down and Michael has a lighter one from John Lewis. White bed linen is The White Company. I am on the hunt for some white patterned square cushions (maybe with a bit of black, berber style?) and I have no idea what colour throw to get. Facing the bed on the chimney breast is a tv with an apple tv connected. I know a TV in a bedroom isn't for everyone but it is one of my favourite places to curl up and forget the world. I have no idea which tv it is apart from it being Sony. The left hand side is where my 'babestation' lives, I bought this made.com desk a while ago and need to find the perfect stool. It is full of all my make up and my perfume sits on top, I will be buying some cute shelves for my perfumes and pretty knick knacks. Oh and the antler used for my necklaces is from Cox and Cox. Lighting wise the main light is the Gold Shamley Sphere from Laura Ashley, then 2 custom wall lights on the panelling from Dowsing and Reynolds. 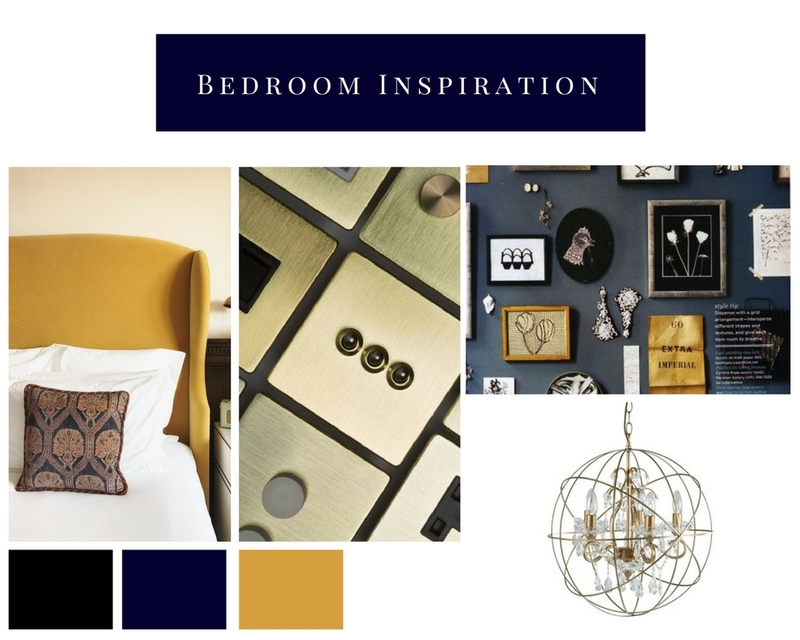 Also from there are the plug sockets (gold with black inserts) then the dimmer switch which is matt black with a gold knob (its beautiful, in the main image above). The panelling is going to be painted in Farrow and Ball's 'Black Blue'. I've not even swatched it, I just know it will look lovely with the mustard bed and pale walls. The floor we will address in time then it's just a matter of getting the final bits done (curtains, prints on walls etc) to finish this room off. Something I am about to purchase but not entirely sure if it will be 'too much' are these side tables, I think I need to see the panelling and the bed in place first but they are currently in the sale...I don't know! Work starts next week so I will upload another post of how the panelling was done and finished images. I can't wait to have our first room finished!